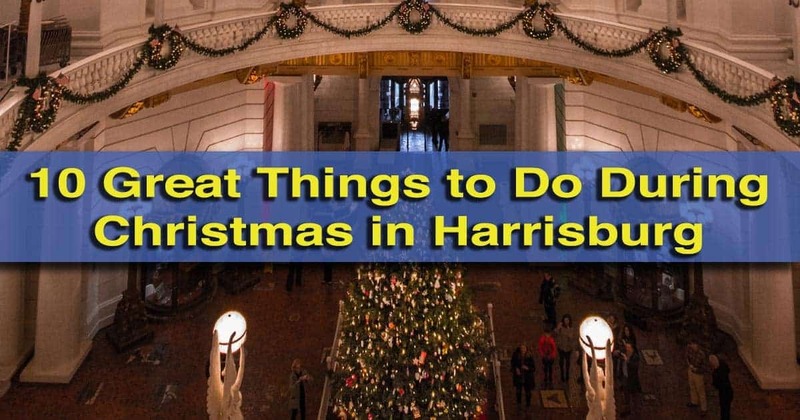 There is a lot to love about Christmas in Harrisburg, Hershey, and the surrounding area. Without a doubt, there are enough holiday events and activities to do in the region to keep anyone busy. Whether you want to enjoy the beauty of Christmas lights, do a little shopping, or sit back and listen to festive music, there’s no reason to be a Grinch this holiday season. Hershey Sweet Lights is one of the most festive places in the Harrisburg and Hershey areas. Few things go together better than the holiday season and the Sweetest Place on Earth, and each year, Hershey, Pennsylvania, turns itself into a fantastic destination for the season. One of the highlights of any visit to Hershey at Christmas is Sweet Lights. Hop in your car and drive through this festive attraction. Along the way, you’ll see 600 illuminated and animated displays that are sure to delight. 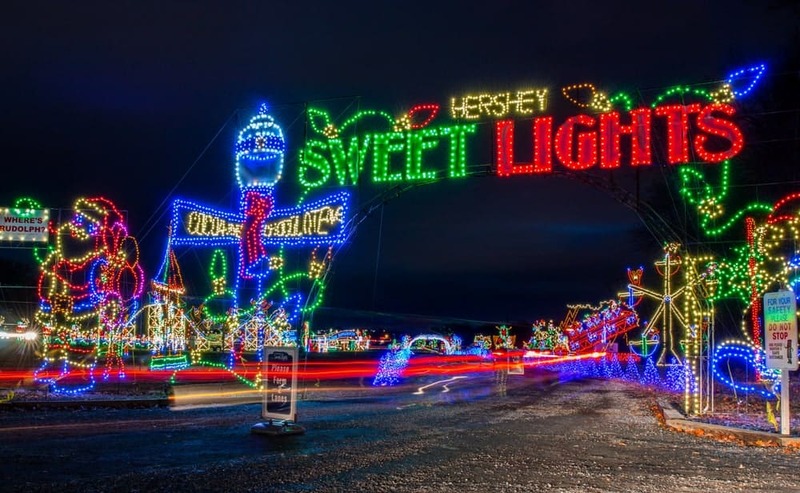 In 2018, Hershey Sweet Lights is open from November 16 through January 1. For more information, check out our full review of Hershey Sweet Lights. 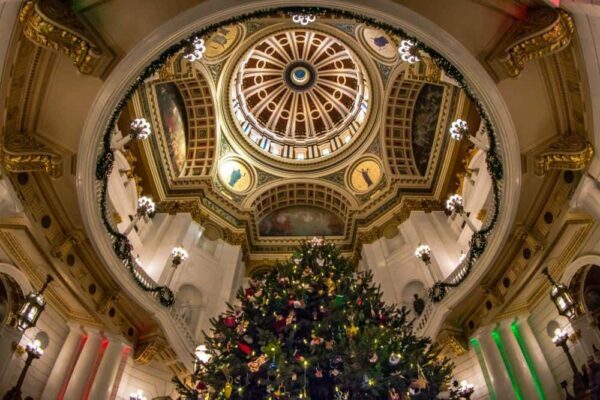 The Pennsylvania Capitol is especially beautiful during the holiday season. The Pennsylvania Capitol in Harrisburg comes to life during the holiday season. In addition to a beautiful tree inside the rotunda, the Capitol also is host to a variety of musical concerts throughout the month of December. Stop by and enjoy a free concert by local schools and singing groups in the rotunda and marvel at the beautiful tree. While tours of the Pennsylvania Capitol are recommended for a great overview of the building and its history, visitors can also opt to simply take a self-guided tour. The Middletown and Hummelstown Railroad features two different Christmas trains this holiday season. The Santa Surprise Train and the Polar Bear Express both feature festive Christmas activities and visits from Santa himself. Of course, you’ll also enjoy the trip along the banks of the Swatara Creek as the train travels from Middletown towards Hummelstown and back. Trains run on most weekend days between November 24 and December 23. For more information, visit the railroad’s website. Don’t miss your chance to see the festive lights at Little Buffalo State Park in Perry County from December 17-23. Located a short distance north of Harrisburg, this historic and beautiful park features thousands of lights along a quarter-mile trail. Along the way, meet Santa in the woods, enjoy live music, and purchase delicious treats like hot chocolate and cookies. For more information, visit the park’s website. Hersheypark is beautiful during Christmas Candylane. 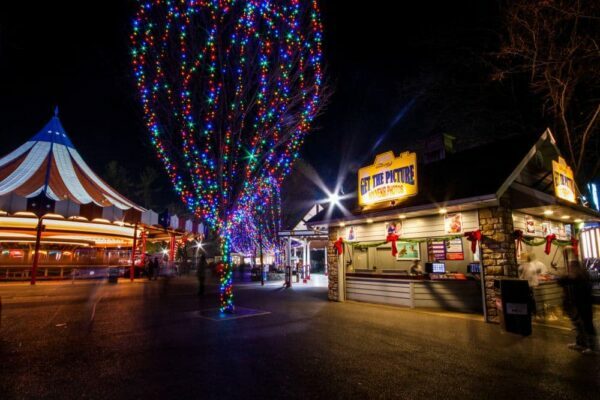 Hersheypark comes to life during the holiday season with decorations, special shows, and much more. More than 4,000,000 lights are displayed throughout the park, creating a festive environment for those wanting to hop on the many open rides. Don’t miss Santa and his reindeer, the holiday lights show, and their delicious hot chocolate. Christmas Candylane is open weekends from November 16 through January 1, 2019. Find out more in our full review of Hersheypark Christmas Candylane. From December 14-23, Gettysburg’s Majestic Theater is home to “A Christmas Carol.” This family-friendly adaptation of Charles Dickens’ famous novel is put on by more then 40 local actors, singers, and dancers. For more information on how to see this classic play at this historic theater, visit the Majestic’s website. The Hershey Symphony will be putting on their annual holiday concert on December 8, 2018 at the Hershey Theater. Selections will include pieces by modern artists such as the Trans-Siberian Orchestra and Mannheim Steamroller, as well as classics like the Hallelujah Chorus from Handel’s Messiah. For more information, visit HersheySymphony.org. 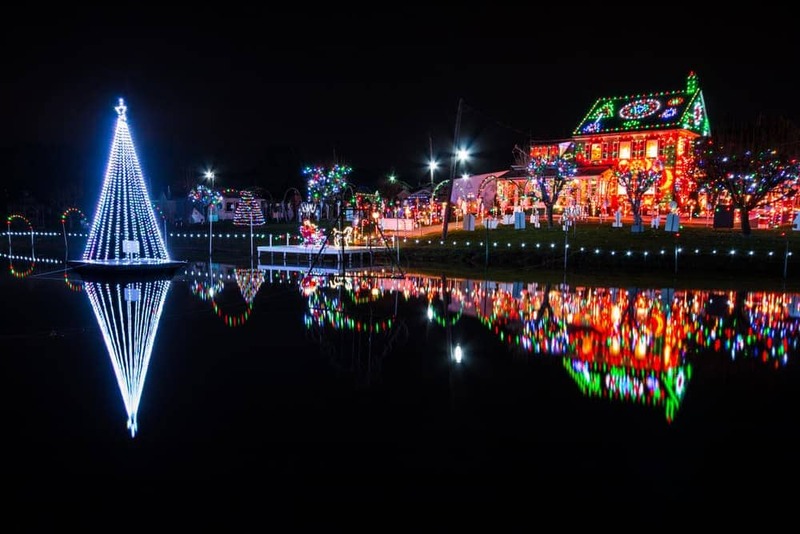 Koziar’s Christmas Village is one of the top things to do a Christmas in Pennsylvania. Sitting about an hour from the city, this winter wonderland is well worth the drive to see. This farm in the middle of rural Berks County features more than a million holiday lights glistening in the cold winter air. Stroll through the Christmas village enjoying festive music, a variety of scenes, model railroads, and much more. Koziar’s is open from early November through New Year’s Day. For more information on this amazing holiday attraction, check out our full review of Koziar’s Christmas Village. Christmas Magic: A Festival of Lights is a festive holiday attraction in York. Open from November 23 through the end of 2018, this half-mile walking trail through Rocky Ridge County Park is sure to put you in a festive mood. Featuring more than 600,000 lights, the trail passes by animated scenes, heated pavilions, and much more. Live music is offered throughout the event and children can visit with Santa. For more information, click here. Looking for the perfect gift (and didn’t find it on our PA gift giving guide)? Head to the Farm Show Complex in Harrisburg for the annual Christmas and Gift Show. Open from November 28 through December 2, this event features hundreds of local and national artisans selling handmade and unique gifts that are perfect for the whole family. Come with your shopping list, and you’ll no doubt leave with much of it checked off. For more information, visit the event’s website. Ring in 2018 with the Strawberry drop in downtown Harrisburg. 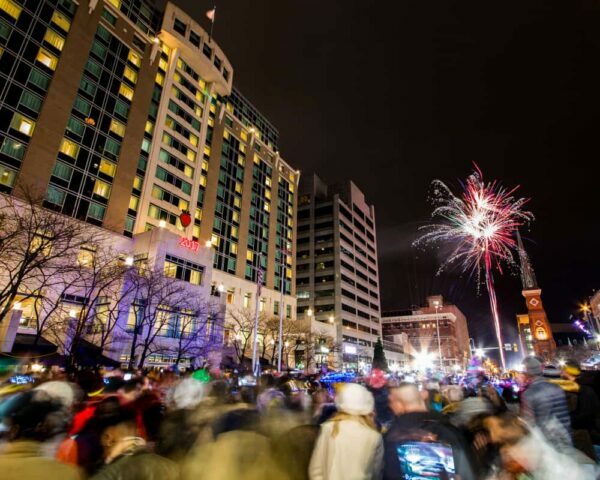 End the holiday season on a high note by celebrating New Year’s Eve in downtown Harrisburg. Enjoy live music in a festive environment at Market Square before the dropping of the strawberry at midnight rings in 2019. Of course, Harrisburg isn’t the only place in the area that features a New Year’s Eve drop. Other great choices include the pickle in Dillsburg, the sled in Duncannon, the rose drops in York and Lancaster, and many more. If you want to photograph some of the festive sights in downtown Harrisburg, join me for my Sunset and Nighttime Photography Workshop on Saturday, December 15, 2018! Looking for even more things to do this holiday season? 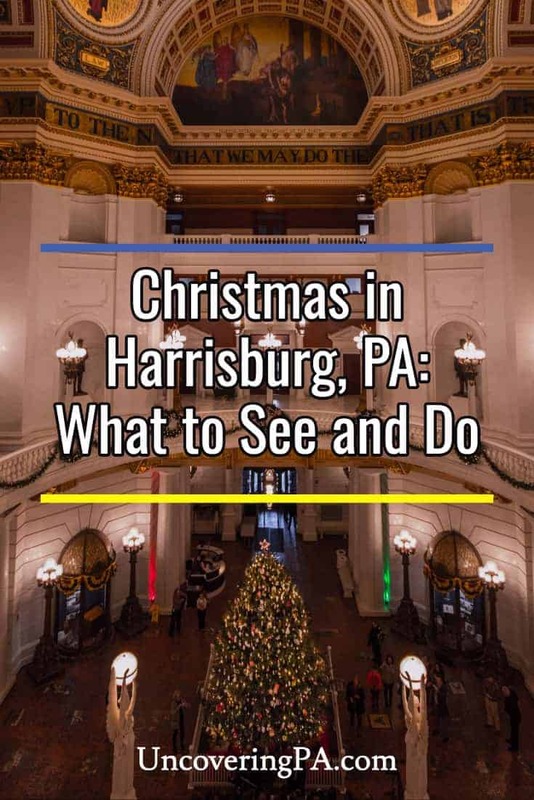 Check out our top Christmasy things to do in Pennsylvania, the most festive towns in PA, our top picks for Christmas events in Philadelphia, the best holiday attractions in Bethlehem, Pennsylvania, our favorite ways to experience Christmas in Lancaster County, and the best Christmas lights in Pittsburgh.